Helen Colijn, a survivor of the Palembang prison camp on Sumatra during World War II, tells how she, her mother and sisters were attacked by the Japanese military while fleeing the area by ship. The camp held about 600 women and children, many of whom were missionaries, nuns, teachers and nurses. One missionary was Margaret Dryburgh, who wrote down music on scraps of paper, music that she had heard many years earlier. This "remembered" music was then arranged for four-part chorus of women's voices, with the help of Norah Chambers. 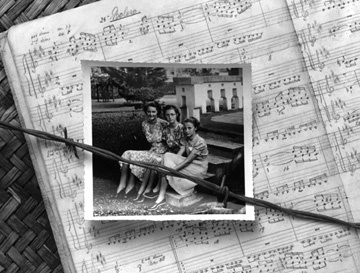 Thirty women rehearsed this music under severe conditions in 1943. They surprised their fellow prisoners on December 27, 1943 with a concert that included the Largo from the New World Symphony by Dvorak and several other compositions from symphonic and piano literature. The concerts continued throughout 1944 and early 1945. By then over half of the chorus had died, and the chorus ceased to function. Dryburgh's arrangements came to the attention of the Peninsula Women's Chorus in Palo Alto, California in 1982, and the Chorus has often performed this music since then. Patricia Hennings is director of the Chorus, and tells on this program how she and the Chorus encountered the music. The one-hour radio program was produced in Santa Cruz, California, and has been broadcast many times in Australia and in the United States over the past several years. Its timeless message is that music can give hope and the will to survive, even amid despair. Most of the interview material in this program was recorded in 1983, with some additional narration added in 1986. The recordings were made in 1985. A second program was produced in 1987 and is available as Part 2. To request the radio program for broadcast or home use please contact the producer.